All the fixtures, results, league tables and competitions details. Please note that sometimes there are result updates posted without any comment here, so do check the appropriate section for up-to-date information. 21 April - Venue for Individuals (7 May) has to be moved. Details to follow. Venue for Mixed Pairs (30 April) may have to move as well. UPDATE - Mixed Pairs (30 April) moved to Devon Yeoman. Individuals venue(s) to follow. 18 April - Next rounds of Individuals and Captains Cup now online plus an update to Sunday scores/tables. 17 April - All Captains Cup scores received. Wednesday Team Cup scores online. when received. Mixed Pairs draw now online. 16 April - Some Captains Cup results now in. Pre-AGM will be at the Horse & Groom, Heavitree on Wednesday 8 May, probably starting at 8pm. See below for other details. 15 April - The Black Horse team inform us that they are unable to continue this season and have withdrawn. Tables and fixtures have been amended. The Pre-AGM is fast approaching. Date is Wednesday 8 May at the Horse & Groom, Heavitree. If you have any proposals for rule changes for next season then please submit them, in writing, to the committee for scrutiny at the Pre-AGM. All proposed rule changes must go through this meeting to stand a chance of being presented to the AGM. Any nominations for committee posts should also be presented to this meeting as well. Just missing the one Sunday score now. 14 April - Final Wednesday score in although not via email! Sunday updates as received. (Now arriving). 11 April - More All Individuals results in and online. Wednesday results updated with scores received today. 10 April - Individuals result now trickling in. Updates as we receive them. Wednesday results now trickling in. 8 April - Draw received for the Wednesday Team Cup semis. Results for all Sunday games were in by 11pm meaning complete updates online last night! 7 April - I have been given the venue for the Singles now. All matched to be played at Allstars. The date will be confirmed later depending on feedback from email sent out but we are still aiming for 9 April. Wednesday Cup and other competition draws should be online later today. 10pm - Sunday results now coming in. 5 April - Result for last game now in, updates online. 3 April - First results now in and online. Awaiting Individuals venues and confirmation of date. Also expecting Captains, Wednesday Cup and further Pairs draws. 31 March - Next round of Individuals online. Venues will be advised later this week. 28 March - All results of games played now in. Kings v Heart of Oak to be sorted. 27 March - Pairs results coming in and now online. Still awaiting two Sunday league results. Email is working! 26 March - Still missing two Sunday results, hope there isn't an email problem. 24 March - Waiting for tonight's updates which are now trickling in. Found out missing Wednesday score was due to match being postponed, but nobody bothered to tell me. 21 March - All but one Wednesday result in now, updates online. 20 March - Result coming in. Updates until 11pm as usual. 19 March - Final Sunday score in tonight, results and tables updated. Result in for Pairs Prelim as well. 17 March - Results coming in for tonights' games. Updates tonight until around 11pm. 14 March - Scores for all games in by this morning so updates went up then. 13 March - Results starting to come in so updates tonight until around 11pm. 11 March - Second Sunday Cup score online. Exeter Snooker Club will meet Horse & Groom C in the Final, Sunday 9 June. 7 March - No Individual results received so far so no real updates yet. Pairs and Mixed Pairs draws will be online as soon as a couple of slight problems are solved. 2 March - The Sunday Cup draw went up on Friday, I forgot to mention it! Results and table updates to follow when I get some. 1 March - Couple more Wednesday results and updated tables. 28 February - Finally received the Individuals draw and it it now online in Competitions or Wednesday or as a Pdf download. Will attempt to contact everyone but if you know someone taking part, please let them know as well. More Wednesday results online as well. 27 February - Still chasing the Singles and Sunday Team Cup details. Hope to have them later today. Some Wednesday results now online. 24 February - Sunday results and tables should be up later depending on the results coming in on time. Results starting to come in now. Just noticed that we are 2/3rds of the way through the fixtures (10 left) although there are four weeks added with Cup games and holidays before we finish in June. 22 February - Final score received, results and table updated. 20 February - Results will be late tonight as I am having a rare weeknight out. 18 February - Last score in so results and tables updated. 17 February - Trying to find out why one score was missing last Sunday. Hopefully have some news later. (Match postponed but message went astray somewhere). Reminded the Competitions Secretary that the next round of the Singles is due soon. Tonight's results will appear as they are received. 15 February - Results in for all Wednesday games and tables updated. 14 February - All but one score in now so results and tables updated. 13 February - Wednesday updates will follow later. One result missing from Sunday for some reason, so if anyone knows the Nelson v Allstars score, please let me know. 11 February - Further Sunday results online. 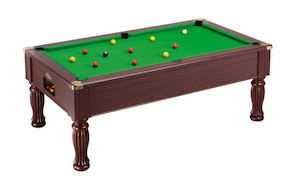 Snooker Club v Railway Club fixture was reversed for whatever reason. 10 February - Latest Sunday updates. 7 February - All but one Wednesday score in now. 6 February - Allstars DT v Black Horse postponed. All other results will appear when received. 3 February - Sunday results and table updates as received tonight (up to 11pm anyway). 10.pm - First results coming in now. Older news items have now been moved to another page which should help speed up loading this page. For older News items click here if you need to check on anything. Covers near end of May 2018 to end of January 2019.